As your business expands, so do your needs. What begins as a small operation can grow into a thriving, productive business. It’s times like these that you may find yourself using more paper than you ever have imagined. 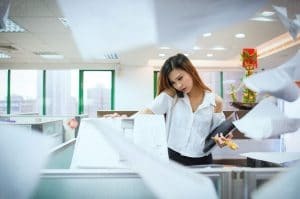 Replacing paper over and over again can be a horrible hassle, but the vast majority of copiers give you the option to expand your copiers paper capacity. All you need to do is add some extra paper trays, which is far cheaper than upgrading your whole machine. There are a number of reasons to add additional paper trays to your copier. Most copiers and multifunction devices have a carrying capacity of between 500-5000 sheets. To figure out the best paper tray solution for your business you need to understand your paper usage. If you know your monthly consumption, then divide that number by 20. This number is your daily usage. You don’t want to go off that number exactly because you don’t want to find yourself refilling the tray every day. Instead, multiply your daily usage by 1.5x to give yourself some wiggle room, and round up to the nearest 500 so you have a little extra for the busiest days. If you find yourself still running out of paper after adding on your additional trays then you should consider upgrading your lease.